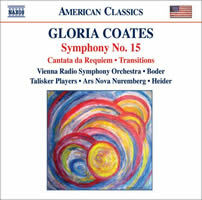 Gloria COATES: Symphony No. 15, “Hommage to Mozart” (2004-5); Cantata da Requiem (1972); Transitions (1984). Vienna Radio Symphony Orchestra, Michael Boder (cond. ); Teri Dunn (sop), Talisker Players, Toronto; Ars Nova Ensemble Nuremberg, Werner Heider (cond.). Naxos 8.559371 (http://www.naxos.com/). Gloria COATES: No. 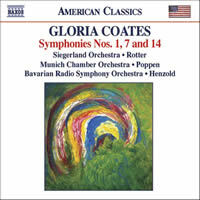 14, “Symphony in Microtones” (2001-02); Symphony No. 1, “Music on Open Strings” (1972-73); Symphony No. 7 (1990). Raymond Curtis (timp), Munich Chamber Orchestra, Christoph Poppen (cond. ); Siegerland Orchestra, Jorge Rotter (cond. ); Bavarian Radio Symphony Orchestra, Olaf Henzold (cond.). Naxos 8.559289 (http://www.naxos.com/). Melding hymn tunes, microtones, complex canons and continuous glissandos, Coates’ riveting symphonies take the Ives highway but go off-road after Ligeti’s exit (read about her string quartets here). Unlike many of her contemporaries, Coates’ expressive power matches her ability to surprise. The three-movement Fifteenth, Hommage to Mozart, neither neo-Classical nor a Post-Romantic pastiche, slings weighty notes. At the symphony’s center, a retrograde Ave Verum Corpus lurks beneath slowly spreading glissandos. Having recently heard Mozart’s motet at a memorial service, it’s hard not to associate this grand work with the ache of mourning. With its antiwar texts, the Cantata da Requiem foreshadows Coates’ later style despite a resemblance to spongy Crumb. Mature Coates arrives with the Transitions, essentially a chamber symphony, which was reworked into Symphony No. 4. There’s a horror-movie build to the slowly tearing string glissandos of the Seventh’s third movement, Corridors of Time, as complementary brass lines soar. The Fourteenth’s first movement, Lamentation: Homage to Supply Belcher (1750-1836), adds unexpected accents before introducing the American hymn composer’s tune in a macabre realization. The First (in memory of teacher Alexander Tcherepnin) employs a Chinese scale, scordatura (requiring retuning during the third movement), and gamelan effects. While it would thrill to hear these symphonies live, few American orchestras or their audiences have taken to her music. These fine performances and recordings (five German, one Canadian) were made between 1980 and 2006. 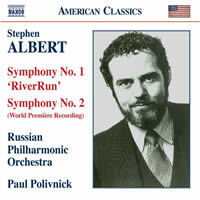 Stephen ALBERT: Symphony No. 1, “RiverRun” (1984); Symphony No. 2 (1992, incompl. ; rev. Sebastian Currier). Russian Philharmonic Orchestra, Paul Polivnick (cond.). Naxos 8.559257 (http://www.naxos.com/). 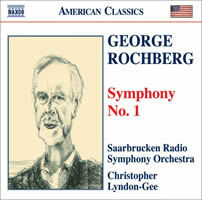 George ROCHBERG: Symphony No. 1 (1948-49, rev. 1977, 2003). Saarbrücken Radio Symphony Orchestra, Christopher Lyndon-Gee (cond.). Naxos 8.559214 (http://www.naxos.com/). The scoring of Albert’s First suggests late Stravinsky cohabiting with some minimalist touches, e.g., walking bass lines and ostinatos. Compared to the premiere recording on Delos D/CD 1016 with Rostropovich leading the National Symphony Orchestra, Polivnick prefers milder contrasts and thankfully subdues the orchestral piano. Inspired by Finnegan’s Wake, Albert’s RiverRun employs the tune which Joyce had notated in his book, with each movement representing moving waters. I recall this First’s impact in the years after its premiere; Albert had confidently struck a balance between serial and post-Romantic. He died in a car accident before completing his Second, here orchestrated by Sebastian Currier. It dwells in Sibelius’ long shadow, though we do hear Albert’s voice evolving more distinctly. Two large outer movements restrain a quick-paced scherzo. Lyrical lines predominate, and the conclusion soars triumphantly. Had Albert lived longer, I imagine his symphonic cycle comparing with Simpson’s in number. Rochberg’s First is a sprawling monster. Given its exaggerative mien, suggesting the best of Stravinsky and Bartók’s music for the dance, I would have taken it for a ballet score had I stumbled across a radio broadcast. The five movements, exceeding an hour, lurch between fire and ice, albeit in a less succinctly brutal fashion than the acclaimed 1955-56 Second. Despite his unpolished ideas, Rochberg’s potent orchestration puts him ahead of most others I cover in these remarks. Having already released Rochberg’s Second and Fifth with Naxos, the Saarbrücken team nails this earlier score. 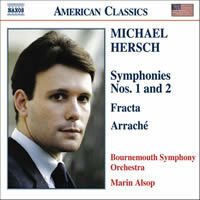 Michael HERSCH: Symphony No. 2 (2001); Fracta (2002); Symphony No. 1 (1998); Arraché (2004). Bournemouth Symphony Orchestra, Marin Alsop (cond.). Naxos 8.559281 (http://www.naxos.com/). 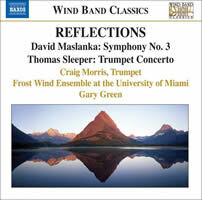 “Reflections.” Thomas SLEEPER: Trumpet Concerto (2003); David MASLANKA: Symphony No. 3 (1991). Craig Morris (tpt); Frost Wind Ensemble at the University of Miami, Gary Green (cond.). Naxos 8.570465 (http://www.naxos.com/). Naxos delivers Hersch’s two angry-young-man symphonies wrapped in jagged shards. The music echoes the 20th century’s most aggressive and mournful orchestral pages (Rochberg, Varèse, Pettersson, et al.). Pity the “nice” composer who follows him in concert. The sober 1998 First, emulating dog-eared Shostakovich mannerisms, runs third, between two more recent pieces demonstrating a more confident command of color. Fracta’s craggy gestures suggest Silvestrov’s bleakly static soundscapes. Occasionally a knife blade glints in the darkness. The most recent Arraché, with its discordant fist-waving, soon extinguishes itself. The 19:18 overwound Second reveals some wonderfully mean-spirited moments. I’m keen to see where Hersch goes next and hope that Naxos takes us there. A true measure of symphonic wind-ensemble music: when the listener doesn’t long for strings. At 17 minutes, Sleeper’s trumpet concerto is an engrossing warm-up to Maslanka’s grand 48-minute symphony. Sleeper asks for agility and depth and Morris delivers. Maslanka’s gallant Third sways between boisterous Shostakovich sneers and a glacial minimalism which Nyman or Adams would recognize as their offspring. Buried deep in entrancing folds are gestures reminiscent of Nielsen and Sibelius. Perhaps best of all, the music appears not to take itself too seriously, as in the way a robust Mahlerian flourish effortlessly slides into a minimalist cadence or a late-’80s sitcom theme. The five movements cover a lot of ground: The initial bravado reinforced with a pungent scherzo gives way to two laments. Maslanka’s recorded symphonies number at least seven, several for symphonic winds and percussion, orchestra or band. The Frost Winds deliver top-drawer elegance. Adolphus HAILSTORK: Symphony No. 3 (2003); Symphony No. 2 (1998). 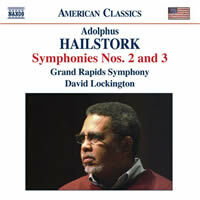 Grand Rapids Symphony, David Lockington (cond.). Naxos 8.559295 (http://www.naxos.com/). 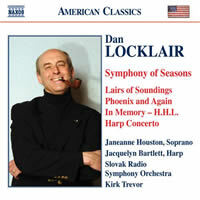 Dan LOCKLAIR: Symphony No. 1, “Symphony of Seasons” (2002); Lairs of Soundings (1982); Phoenix and Again (1983); In Memory – H.H.L. (2005); Concerto for Harp and Orchestra (2004). Janeanne Houston (sop), Jacquelyn Bartlett (hp), Slovak Radio Symphony Orchestra, Kirk Trevor (cond.). Naxos 8.559337 (http://www.naxos.com/). Naxos’ Hailstork program begins with his gentler Third. The opening Revueltas-like fanfare’s relaxed layering suggests Reich’s procedures. Bluesy gestures in faster passages recall Copland’s Organ Symphony, with the slow movement’s restrained dissonance sounding to this listener like advances over Barber. The solemn Second’s core is its 11-minute slow movement, inspired by a visit to Ghana’s coastal dungeons where slaves were detained prior to shipment. The final movement celebrates the determination and survival of African-Americans. These symphonies may not stretch boundaries, but they are solidly engineered, and the Grand Rapids Symphony ably tackles these grandiose, four-movement compositions. Locklair’s polished orchestral works offer comforting tonality with lilting melodies. Symphony of Seasons’ four obligatory movements glow cordially, its brightly genial first movement, Autumn, festooned with xylophone and piano starbursts. The last movement absorbs the familiar Sumer is icumen in. As the celebratory Phoenix and Again and the more recent Harp Concerto reveal, Locklair has made a successful career of soaring between pentatonic prairies and Holstian galaxies. Lairs of Soundings wraps two poems around a wordless vocalization for high soprano and string orchestra. In Memory – H.H.L. offers a deeply felt memorial for the composer’s mother. 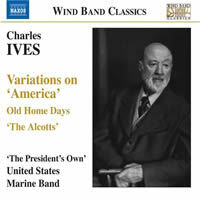 “Variations on ‘America’.” Charles IVES: Asst. comps arr. for band. “The President’s Own” United States Marine Band, Col. Timothy W. Foley (cond.). Naxos 8.570559 (http://www.naxos.com/). 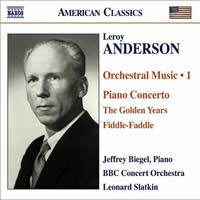 “Orchestral Music 1.” Leroy ANDERSON: Bugler’s Holiday (1954); Blue Tango (1951); The First Day of Spring (1954); Belle of the Ball (1951); Governor Bradford March (1948); Clarinet Candy (1962); The Captains and the Kings (1962); The Golden Years (1962); Chicken Reel (1946); Fiddle-Faddle (1947); The Classical Jukebox (1950); China Doll (1951); Balladette (1962); Arietta (1962); Piano Concerto in C Major (1953). Jeffrey Biegel (pno), BBC Concert Orchestra, Leonard Slatkin (cond.). Naxos 8.559313 (http://www.naxos.com/). “The President’s Own” playing Ives? Just imagine — the insurance exec’s conflagrations licking White House walls! I can’t recall a more detailed Naxos booklet. This is one for scholars and fans. Included are college tunes as well as transcriptions of pieces and sketches which eventually grew into Three Places in New England (Overture and March ‘1776,’ ‘Country Band’ March), New England Holidays (Decoration Day) and the Fourth symphony (Fugue in C). The final transcription brings the Concord Sonata’s Alcott movement to life. Other numbers are derived from songs and marches. The Commander-in-Chief’s band plays with precision and polish and probably better than the ensembles Ives heard his father conduct. From Bugler’s Holiday’s oleaginous trumpets to The Golden Years’ schmaltz, here’s a collection of Anderson’s orchestral ditties Naxos identifies as the first installment of a series. Crack solos appear from every corner, especially trumpets and clarinets. Like a Spike Jones tribute, The Classical Jukebox, with its clever juxtapositions and stuck-needle lark, is sure to please. The big surprise is the 1953 Piano Concerto, falling somewhere between Rachmaninoff and the Warsaw Concerto. Anderson excelled in small forms. His episodic concerto sequences different moods, the soloist glittering from above. Some numbers (Chicken Reel and Fiddle-Faddle) might seem stiff, Arthur Fiedler and the Boston Pops being a tough act to follow, but the good sound is stately and resonant.